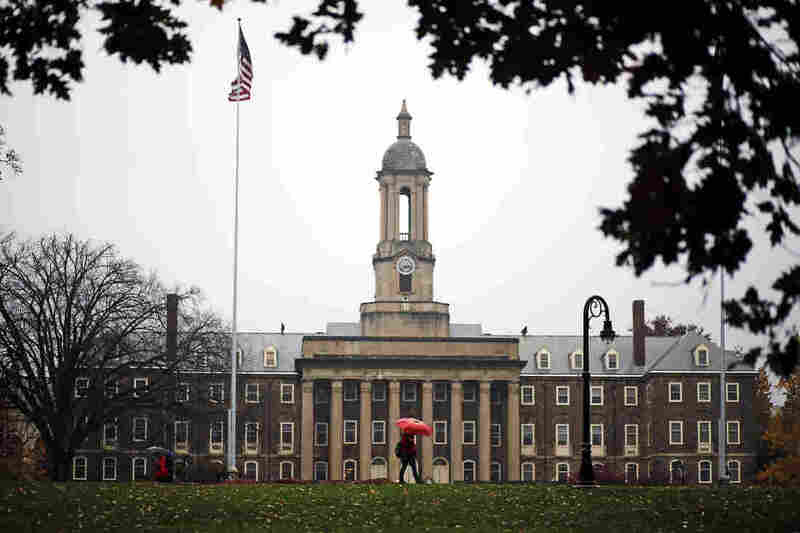 Penn State Student's Hazing Death Was No Accident, Grand Jury Says : The Two-Way Eight Beta Theta Pi fraternity members face charges of involuntary manslaughter over the death of a new pledge in February. For nearly 12 hours after Timothy Piazza fell, no one called an ambulance. Administrators at Penn State's main campus in State College, Pa., had already banned Beta Theta Pi after the hazing death of a pledge, which has resulted in involuntary manslaughter charges. His death was initially ruled an accident. But a grand jury that looked into the case of Timothy Piazza, a Penn State University student who died after a night of excessive drinking in February, is now calling it "the direct result of encouraged reckless conduct." Eight Beta Theta Pi fraternity members face charges of involuntary manslaughter; an additional 10 face lesser charges. The charges include multiple counts of hazing, reckless endangerment of another person, and furnishing alcohol to minors. Piazza's injuries included a fracture at the base of his skull and a ruptured spleen. It wasn't until 10:48 a.m. the morning after a Feb. 2 party that an ambulance was called. The circumstances around the final hours of Piazza's life are detailed in a grand jury document that was released Friday. The evidence includes an account of hours of surveillance camera footage from inside the Beta Theta Pi house, where prosecutors say Piazza died after hazing on "bid acceptance night" for new pledges. "In August, we dropped off our two sons here at Penn State University to further their collegiate experience. Today, we're only going to be bringing one of them home, due to a senseless and very preventable tragedy that ... caused us to bury our son three months ago." Piazza thanked the district attorney "for swiftly moving to bring those who caused Tim's death to justice." In the hours of footage, the grand jury says, Piazza is seen suffering from the severe effects of consuming large amounts of alcohol and from a fall down a flight of stairs around 11 p.m. And around 5 a.m., the court document says, he fell and hit his head on a metal railing. By using a blood sample from Piazza after he was taken to the hospital as a reference, pathologist Dr. Harry Kamerow provided an estimate of the young man's blood alcohol content at different portions of the surveillance video. The criminal charges were announced Friday, just before the university held spring graduation ceremonies. The charges include 50 counts of hazing and reckless endangerment, stemming from hazing activities that date to spring 2016. Weeks after the hazing incident was reported, Penn State permanently banned Beta Theta Pi fraternity and put new restrictions on fraternities and sororities aimed at reducing hazing and forced drinking. Many of the activities that led up to Piazza's death are explicitly forbidden in the fraternity's "pledge manual," a guide for new members. Citing the spring 2017 edition of that manual, the grand jury said it bans possessing, consuming and abusing alcohol during a fraternity-related event and forbids "drinking games," providing alcohol to minors and allowing alcohol at initiation ceremonies. The manual also prohibits hazing, stating, "Permission or approval by a person being hazed is not a defense." That prohibition is broad, ranging from activities such as paddling and "morally degrading" activities to scavenger hunts, the grand jury says in its presentation. Many of those bans are included in the fraternity's "risk management" policy, but as one of the fraternity chapter's officers told the grand jury, the risk manager also heads the social committee and "historically shoulders the responsibility of obtaining alcohol for Beta events," according to the court document. Months before Piazza's death, the fraternity had dealt with another head injury sustained by a new recruit. The grand jury says a former pledge, Kordel Davis, told police that after drinking excessively on his bid acceptance night in the fall of 2016, he fell and hit his head, causing profuse bleeding. Davis said fraternity members had picked him up and taken him to an urgent care facility, but no one ever called 911. No one called 911 on the night Piazza was hurt, either. After he was clearly suffering, Davis urged an emergency call but was overruled by his fellow members. Citing the testimony of one of the 14-member pledge class that included Piazza, the grand jury says the activities on the night of Feb. 2 centered on "the gantlet," in which pledges formed a line and were told to drink from a bottle of vodka and pass it down until it was empty. They then ran to and from drinking stations where they drank wine from a bag or shotgunned beer. The fraternity then hosted a party, during which pledges were encouraged to drink more. "The gantlet" was designed to make pledges consume roughly four to five alcoholic drinks in a two-minute span, police say. Police told the grand jury that before the pledge bid acceptance night, one of the fraternity's members spent $1,179 over the course of eight days to purchase "a mass quantity of alcohol" that ranged from cases of vodka and beer to 15 cases of Four Loko. In addition to involuntary manslaughter and other charges, chapter President Brendan Young and Vice President Daniel Casey now face 50 counts of hazing and reckless endangerment, stemming from hazing activities that date to spring 2016. Weeks before the fraternity hosted the fateful bid acceptance ritual, Young and Casey had a text conversation about the risks posed by their plans. "I know you know this. If anything goes wrong with the pledges this semester then both of us are f*****." Many of the members are also accused of tampering with evidence, in what was seen as an attempt to sanitize both the scene at the house and their phones' data to limit the potential fallout from the hazing incident. "This didn't have to happen," Jim Piazza said Friday. "This is the result of a feeling of entitlement, flagrant disobedience of the law and disregard for moral values, that was then exacerbated by egregious acts of self-preservation. Again, this did not have to happen. No parent should have to deal with this." The grand jury said it had learned many of the members were both aware of the risks of excessive drinking and certain that Piazza's injuries would be seen as the result of hazing at the fraternity. "Therefore, over 40 minutes elapsed before they even summoned an ambulance when they discovered Timothy looking deathly ill the following morning," the grand jury said. "And a campaign ensued in the following days to destroy any evidence that would reveal exactly what had been happening behind the doors of Beta Theta Pi." The details in the grand jury documents are "heart-wrenching and incomprehensible," Penn State President Eric Barron said Friday, saying Piazza had endured "inhumane treatment" at the fraternity's hands. "It is numbing how an atmosphere that endangers the well-being and safety of another person could occur within an organization that prided itself on commitment to each other and to its community," Barron said. A previous version of this story incorrectly stated that Timothy Piazza hit his head on a metal railing at 4 a.m. That fall occurred just before 5 a.m.